In January was finishing up an awesome overseas trip that had started in December, when I met Sarah Bedrick in Italy. We spent the first week of 2016 together, had an amazing time and parted ways thinking we’d probably never see each other again. 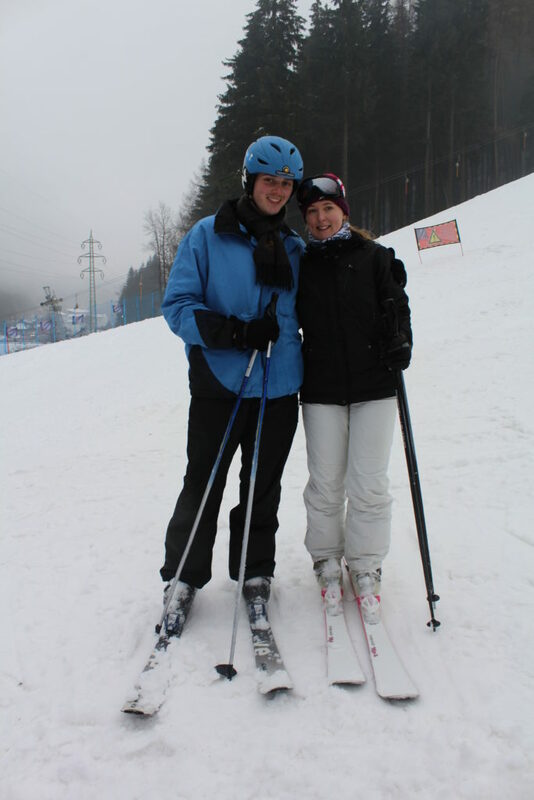 I then spent one more week in the Czech Republic with family and learned how to ski with them. A week later I arrived back in Sydney and out of the blue, I got a call from Sarah. By February, Sarah and I had started a daily routine calling each other several hours a day. My last semester of University started up, and I was also offered, and quickly accepted a promotion at work to take on much more responsibility as supervisor of 10 bar usefuls. In March Sarah came to visit me in Sydney. She booked the flights less than two weeks earlier. Once I got the confirmation, I organized taking a week off of work and planned an itinerary for us that included the best of what Sydney and the Blue Mountains have to offer. What followed was easily the greatest week of my life. I don’t think I ever cried so much in my life as when I had to say goodbye to her at the airport. In April I settled back in a routine. I would wake up, Sarah and I would talk on the phone for 2-6 hours, then I would go to University, then to work and afterwards exercise. Rinse repeat. I also achieved a great level of comfort in my new role as supervisor. ANZAC day came and went at the CBH as the team and I crushed the busiest day of the year. My nightly routine: running the coastal walk from Coogee to Clovelly and back. During May, Sarah came back to Sydney again for another week. By now, I had known for a while that I wanted to spend the rest of my life with her. I knew I wanted to marry her. We had talked for hours and hours about what our futures looked like and the steps we would take together. I didn’t yet have a ring, but I asked her to marry me. The next day we went ring shopping together. I took my final university exam ever in June. Research Methods 3001. Easily the most difficult course I ever took at university. I hired a tutor to help me with getting a handle on it and scrapped through to pass the exam and finally complete my degree. In July I prepared my things and put my affairs in order to leave Coogee, NSW for East Cambridge, MA. I had some farewell dinners and left Sydney with a very strange feeling. Excitement and sadness bundled together. I wondered a couple of times if I knew what the hell I was doing. When I arrived in Boston I spent most of my time getting settled and acclimated to living in a new city and a new country (I’m still working on this!). Three weeks after arriving in Boston, Sarah and I packed up her tiny, tiny, tiny apartment in Cambridge and we moved into our enormous (comparatively) condo in Medford, MA. Much of August was spent driving between Ikea and Medford. We have about two dozen leftover Allen-keys in a draw from all our furniture. We also went camping a couple of times and at the end of the month Sarah and I started a 5 week sabbatical to Morocco and Eastern Europe (6 countries all up). Sarah strategizing the best move in Rummykub. The entire month of September was spent in Hostels and on buses, trains and planes around Europe. I’ve done a lot of travelling in my life, but never with a significant other before. Our sabbatical was filled with all kinds of adventures and challenges, all of which were so more enjoyable because I did them with my best friend, and my fiancé, Sarah. Sarah and I on our last night in Budapest. Two days after arriving back in Boston, it was October and Sarah and I we had taken another flight down to D.C.. My Grant Aunt Lil lives in northern Virginia and we spent a weekend with her and Grandpa, who had come to visit from Chicago. I stayed a few extra days while Sarah had to go back to Boston for work. After she left, Mum came in from Melbourne via Vegas. It had been 4 months since I’d seen Mum at that point and it was so nice to reconnect. By the end of the week Mum had come up to Boston to see our condo and it was great to show her how I was getting along in Boston. It was an emotional time for mum and I but Sarah did an awesome job keeping mum and I happy and comfortable. After Sabbatical, I put on weight, and a beard. By November my job search was in full swing and I started to have some serious interviews. I had waited until after sabbatical to apply. By the end of the month I was deep in the interview process with a couple of great companies. We broke up the flow a little by jet setting once again, this time for Orlando, FL. To spend a warm thanksgiving with the in-laws. The weather down there reminded me of Australia. Back in Boston, on the 2nd of December I received my first serious job offer. On the 5th I received my next. My birthday, was spent agonizing over which offer to accept. Both were great. I ended up taking the offer to work at Rapid7. I started work the following week on the 12th. Since then I haven’t felt regretful for one moment. Christmas Eve, Sarah and I hosted a small dinner at our house with some of the in-laws which was great. Christmas Day we drove up to Salem, NH to spend it at Kris & Jeff’s house and all the other in-laws. It wasn’t exactly the white Christmas I had hoped for (it didn’t snow, at least in Medford) but there was still some snow on the ground up at Kris & Jeff’s place in NH. Best year to date. I’m optimistic 2017 will be every bit as awesome as 2016. TL;DR: Did a Contiki tour of Europe, met a girl, got promoted, got engaged to the girl, graduated university, moved to a new country, moved into new (owned) condo, went travelling overseas again, then again domestically (twice), got offered a job.